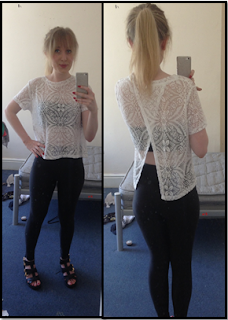 Recently most of my tops have been coming from Miss Selfridge and this is one of my new ones. I literally love it, it can go with anything or even over anything. It has a nice summery feeling and I love the back, I have been looking for a split back top for ages and was so happy when I finally found one. I have had my black disco pants for over a year and they are so comfy, plus they can be used for day time or going out clubbing. I think the sandals add a nice final summer touch to my outfit and gives it a little bit of a grunge look.